A New Venue for Workshops have been organised for those of you reading this in the Long Sutton Area. Silverwood, St James Rd, Long Sutton, Spalding PE12 9AU is a fabulous shopping experience with a room for workshops. Each month I have organised to go into Silverwood and teach how to use your sewing machine for more than straight stitches. All you need is your sewing machine and a darning or embroidery foot. Threads and some fabrics. I will supply patterns and soluble film for the 3D effects. Shibori Dyeing (tie Dye) using procion dyes is on trend this year. All dyes and some fabrics are included in the price. Lampshade making using fabrics of your choice. The Shibori dyed lampshades work beautifully for this workshop. Also returning is Powertex for beginners. This will include your materials to make brooches, bottles for candles, and boxes and plaques. To book just go to https://www.eaubrinkstudio.co.uk/events/ and search for the workshop and date you are interested in. Whilst your rummaging around the events pages why not also look at the rest of the website to see what we get up to? We now have a YouTube channel. It is very new so please do go and take a look. Subscribe, and let me know what you think of the videos. Just go to youtube and look up anita O’Neill and you should be able to see it. 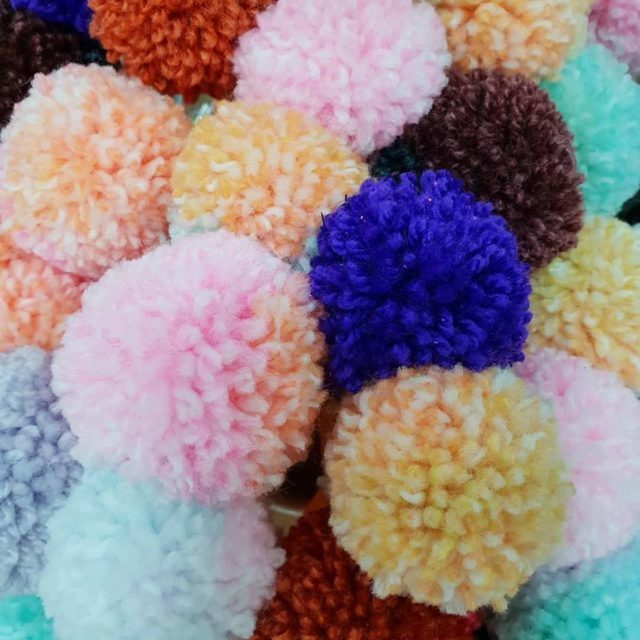 PomPoms is the simple answer to that question. Hundreds of them. Which I am making cushions, pencil tops, rugs, bunting and much much more. I am amazed at how much I am enjoying it too. I particularly love the variegated yarns. So pretty.